Years ago (I’ve been blogging that long? ), I talked about my fickleness when it comes to bedding. I think it’s a rather simple change-up, and since Michigan goes from cold to hot and back to cold again, I need it for the changing seasons. Ya know–cold and hot. I purchased an ivory velvet duvet set from Pottery Barn, and I’ve loved it. It’s a perfect wintery backdrop for accessories (hello, $8.00 Pottery Barn shams! ), and it adds a little more warmth for us. Of course, we’re talking change here. It doesn’t take much, I promise. Literally throw some other throw pillows on there, and it’s a different look. And look #3 still keeps the same set. I changed the shams and pillows and added a throw (Wal Mart!) for a pop of color. My point is that it doesn’t take much. The most I spent on any of the accessories was $15.00, so it’s a relatively inexpensive way to update your look. Of course, the finishing touch is making sure no one messes it up. You may find yourself yelling, “Don’t sit there!” or “Who moved the throw blanket? !”, but that’s very normal. I think. It all looks very nice :). My bed has two styles…. made and unmade. Most of the time it’s unmade unless it’s the holidays and I expect to be having people put coats in my room. We make it like right before crawling into bed. I LOVE your winter bed! It looks so cozy! I love the shams on the winter bed! All 3 options are very pretty. Love all three looks. I’m getting ready to paint my bedroom…what color is on your walls? I agree with you. Looks great! Love your 3 looks ! You did a good job and they all look great ! I love all three looks! I think I especially love the winter one because of the “sweater” pillows – so cozy looking. We never get that cold here in central TX, so even though we own a comforter it’s folded and put away in the closet until company is coming over. Otherwise, I just keep a light berry-colored thermal blanket on the bed that matches my curtains from JCP (of course, it HAS to match!). I do, however, change the throw pillows every now and then for different a look. Gotta keep it fresh! this helped me- I think I need white sheets and just change up the accessories not the main comforter! You are too funny….I would never tell my daughter not to sit on her bed because I just made it. Seriously, it was that I had JUST made it and she was off to school. I have to pass by the room during the day so I just didn’t want her to mess it for 10 minutes then leave. That makes perfect sense! Anyway, LOVE your winter bed! Perfect for MI winters! I love all three options! We moved from Michigan to Oklahoma about three years ago. The big down comforters had to go! We certainly do not get the cold West Michigan weather that I was used to! I have to agree that just changing out the bedding makes you feel like you have a whole new room!! I’m with you! I love to change my bed for the seasons and I live in Florida! As a fellow pillow addict, I love switching it up! And you’re so right. It doesn’t take much to change it up and get 3 different gorgeous yet totally different looks. 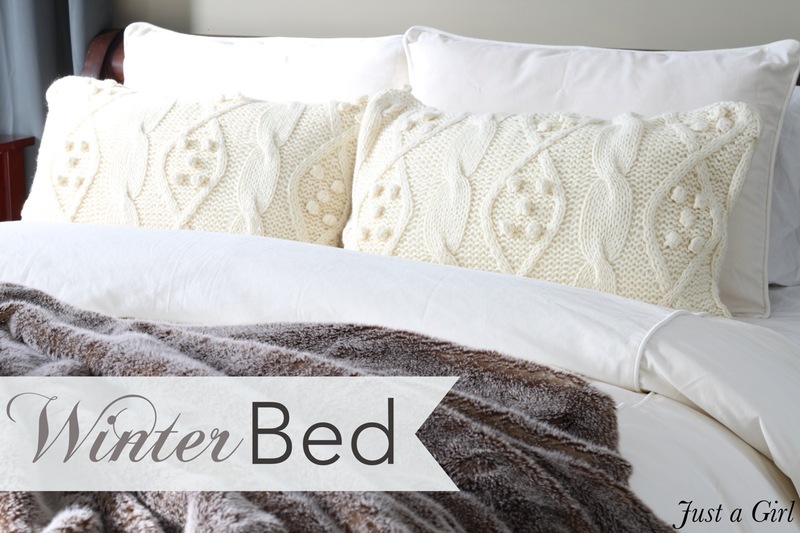 Love your cable knit pillows on your winter bed. Gorgeous!! I need to do this. What a wonderful idea. It might help me with my need to constantly change up things as well. Those warm and cozy pottery barn pillow covers are scrumptious. My first time visit to your blog; what fun I’m having perusing it. I stumbled upon it by googling “Lia Sophia”. I’m a new advisor and quite addicted to looking back and seeing what I’ve missed out on all the years I didn’t know about LS. The google took me to an older post of yours featuring LS an from there I just started nosing around. Love the three different looks; my hubby would probably have a cow if I changed things up; he considers an accessory change to be “redecorating”…LOL!